Libya is a typical example of a colonial or external creation. This book addresses the emergence and construction of nation and nationalism, particularly among Libyan exiles in the Mediterranean region. It charts the rise of nationalism from the colonial era and shows how it developed through an external Libyan diaspora and the influence of Arab nationalism. From 1911, following the Italian occupation, the first nucleus of Libyan nationalism formed through the activities of Libyan exiles. Through experiences undergone during periods of exile, new structures of loyalty and solidarity were formed. The new and emerging social groups were largely responsible for creating the associations that ultimately led to the formation of political parties at the eve of independence. 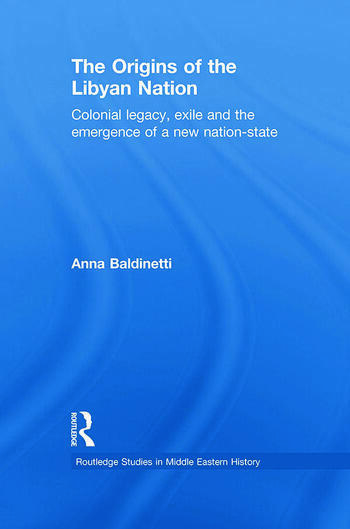 Exploring the influence of colonial rule and external factors on the creation of the state and national identity, this critical study not only provides a clear outline of how Libya was shaped through its borders and boundaries but also underlines the strong influence that Eastern Arab nationalism had on Libyan nationalism. An important contribution to history of Libya and nationalism, this work will be of interest to all scholars of African and Middle Eastern history. Anna Baldinetti is Associate professor of History and Politics of North Africa and Middle East at the University of Perugia. Her research has mainly been focused on the political history of Libya and Egypt in the nineteenth and twentieth centuries.